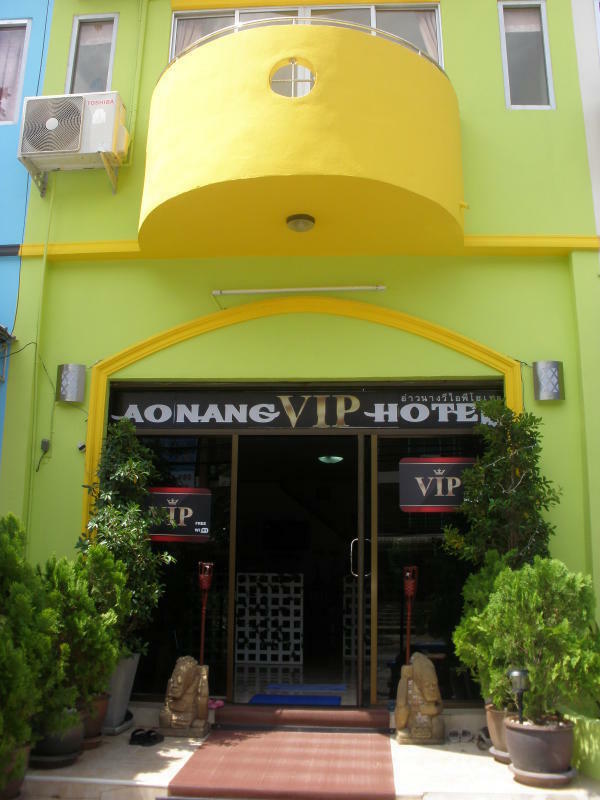 the spanish managed Ao Nang VIP hotel is open 07.00 to 22.00 hrs and conveniently located on the main street in the beach town of Ao Nang, Krabi Province, with easy access to beaches, bars,restaurants and shops. We welcome all visitors, whether you are young backpackers, couples, families with children, or older travellers. Our hotel is managed by an experienced, Thai and French speaking, British hotel manager and his Thai wife,and we offer a choice of clean, kingsize or twin bed air-conditioned rooms with balcony, as well as budget, 3-bed (dormitory) air-con rooms. We also offer guests a budget priced double fan room. All rooms have en-suite bathrooms and H/C showers, and we clean/housekeep daily. We provide you with complimentary towels, toiletries and tea and coffee making facilities. Our 20 guest rooms are located on 4 floors within a private and modern building that is located on the resort main street, and directly opposite the Post Office. We have free wi-fi internet available on all floors. Buses to/from Krabi Town and International Airport stop right outside our hotel. We are just a few minutes from Ao Nang beaches, where you can take long-tail boats to nearby Railay Beach, or catch a daily ferry to Phi-Phi island and Phuket. Our hotel has been designed to provide you with a safe and secure stay. All floors are fitted with smoke detectors, emergency lights and fire extinguishers. Our hotel features a roomy reception area that is staffed from 07.00 to 22.00, with flat-screen TV which offers 60 channels of sport, music, Thai and international channels. There are wall maps in reception for all the major regions of Thailand. We also have secure storage for guests small items of value. There is a large library of DVD movies for free loan to guests along with a book borrow or exchange library. We are open 365 days a year. Our guests often have early morning departures, so our room/bed rates exclude breakfast. We can provide you with a hot all day breakfast - from 07.30 hrs (fried egg, bacon,suasage, ham, beans, hash browns, toast, orange juice, coffee or tea) for 125 baht per person. We also offer a range of local and international beers at competitive prices. Soft drinks are also available. Check In time is from 14.00 to 22.00, If you arrive much earlier than 2pm, we cannot guarantee that your room will be ready, since guests from the previous night may not have checked out yet. We are located on the main road in Ao Nang. 470/1 Moo 2, Tambon Ao Nang, Amphur Meung, Krabi, 81000. Our hotel is about 200 meters from Ao Nang post office ('brysanee' in Thai). If you travel by Airport or local bus, please tell the driver 'you sai mur, song roi met gorn tung brysanee' (On the left hand side, 200 metres before the post office). If you are travelling by your own transport, follow the normal direction signs to Ao Nang. As you enter Ao Nang, our hotel is located on the left side of the main road, about 200 meters before you reach the Post Office. Look out for our large 'VIP' lightbox sign.